The small West Bank village of Nabi Saleh is paying a steep price for a video of Israeli brutality. Widely circulated in recent months, the video shows the mother and sister of 12-year-old Muhammad Tamimi wresting him away from a masked and armed Israeli soldier. The boy was throttled and jammed into boulders on 28 August, despite having a cast on his arm. Israeli politicians not only defended the Israeli soldier’s actions; some argued that he should have behaved in an even more cruel manner. 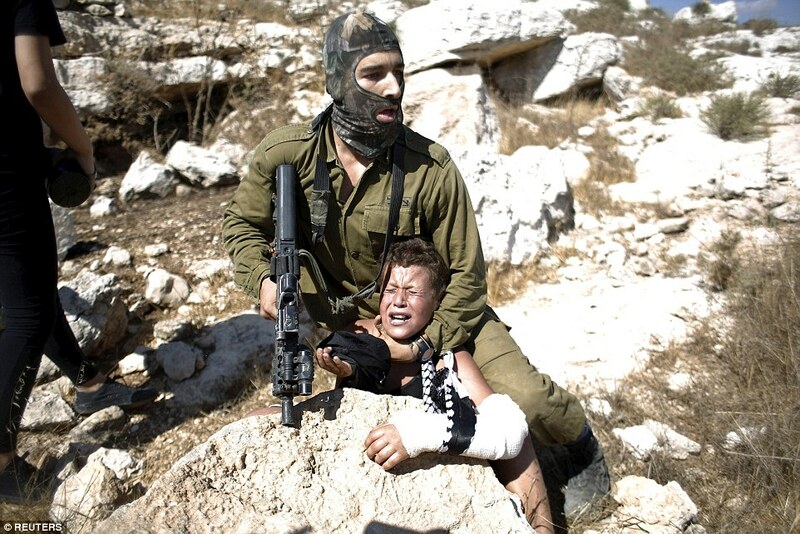 Miri Regev, Israel’s culture minister, said that the soldier should have shot the boy’s unarmed rescuers. 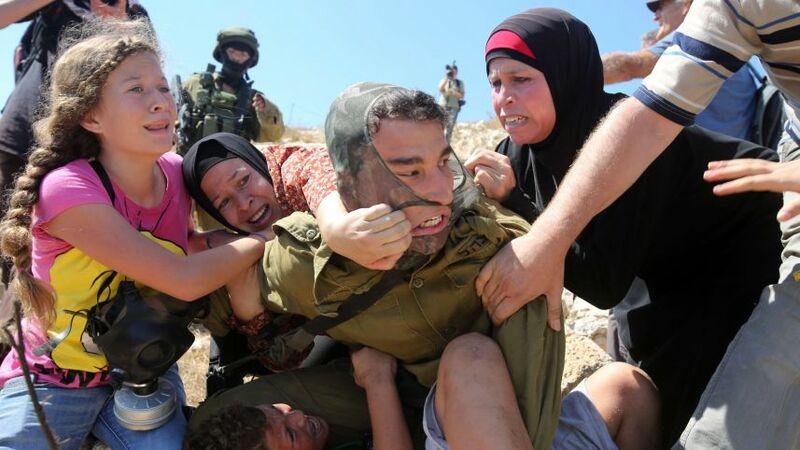 Since the incident, the Israeli army has detained scores of young men from the village and subjected them to lengthy periods of interrogation, during which abusive treatment occurred. Seventeen are currently imprisoned, including Waed Tamimi, Muhammad’s 19-year-old brother. Waed was arrested, along with his 20-year-old cousin Anan, during a 19 October night raid on the home of Waed’s parents, Nariman and Bassem Tamimi. Four other young men were seized by the army that same night, including Louay Tamimi, whose brother Mustafa was killed in December 2011 when a soldier fired a high velocity tear gas canister at his head from a meter away. Bassem Tamimi, who was on a lecture tour of the US when his son was arrested, has himself been detained a dozen times. He has also been tortured and spent three years in prison without a conviction. Bassem and his cousin Naji, the father of Anan, have been recognized as human rights defenders by the European Union. In 2012, Bassem was declared a prisoner of conscience by Amnesty International. The cousins have helped coordinate their village’s unarmed resistance activities. Rather than submit mutely to the confiscation of their land and freshwater spring by Israeli settlers, the residents of Nabi Saleh have for the last six years held spirited weekly demonstrations demanding an end to the Israeli occupation. Israeli and international activists have frequently joined the weekly protests in Nabi Saleh, and face an army deploying stun grenades, tear gas, skunk water, rubber-coated steel bullets and live ammunition. Hundreds of demonstrators have been injured, some permanently, and two were killed. Over the years, as many as 200 villagers have been detained out of a population of just over 500. All of them belong to Tamimi clan. At the 28 August protest, the army arrested Bassem’s 19-year-old nephew, Mahmoud. Vittorio Fera, an Italian activist, was also detained. Fera was swiftly acquitted by an Israeli civil court from the charge of throwing stones and other objects. Mahmoud — who faces identical charges in the military court system — has spent months now in Ofer, an Israeli prison in the West Bank, without a hearing. For Palestinians, including children, there is no presumption of innocence and little likelihood of acquittal, given the 99.74 percent conviction rate in military courts. Most of these convictions are a result of plea bargains, agreed to after the coercive extraction of confessions from children as well as adults. Some prisoners may be sentenced to administrative detention. Under that practice, detainees are held without charge or trial and without being told what evidence the authorities hold on them. The 17 young men from Nabi Saleh may have been marooned in military prisons — where their families cannot visit them or even send them warm winter clothes — because someone from the village has been intimidated into saying who they saw throwing stones. Two young men detained on 9 December have now been released, but Nabi Saleh families fear there will be more arrests. Israel appears bent on doing everything it can to impose collective punishment on a village that serves as the symbol of resistance to a nearly half-century-long military occupation. As the youth await trials and anticipate years in prison, US activists have set up a Facebook page to press for their release. Bassem Tamimi, meanwhile, wonders why the international community has not taken a determined stand against Israel’s relentless repression. Nancy Murray, who for 25 years was director of education at the American Civil Liberties Union of Massachusetts, has worked for Palestinian rights since her first trip to the region in 1988. Nine-year-old Jana tells her story of Israeli occupation using mobile phone. Nabi Saleh, West Bank – When Jana Jihad cut the cake on her ninth birthday on April 10th, she made a wish to “see Neymar,” the Brazilian foot­ball star who plays for Spanish club FC Barcelona. The wish was as far-fetched as the complexities in the life of the third-grader. Dubbed the youngest amateur journalist in the Palestinian terri­tories, Jana hopes to tell her story from the viewpoint of a Palestin­ian child: From Israeli tear-gas to stun grenades, night raids and even losing friends, Jana’s child­hood is often interrupted with dramatic events in the village of Nabi Saleh, north of the West Bank city of Ramallah. 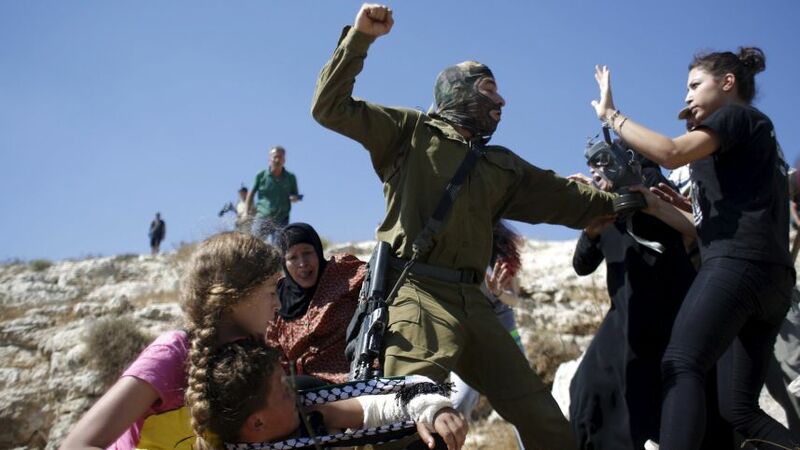 Home for 600 residents, Nabi Saleh is the site of weekly dem­onstrations against the Israeli oc­cupation. Every Friday for five years villagers have protested the occupation that is manifested by a Jewish settlement built on the vil­lagers’ lands. The Israeli army, often present in a military watchtower at the entrance of the village, shuts the village’s entrance with a large metal bar. Tensions rise as local protesters and international peace activists hoist Palestinian flags and head towards the closed gate. The army often tries to disperse the protesters with tear gas, foul-smelling water, stun grenades and even live ammunition. Two young men have been killed in the dem­onstrations. Whereas journalists are present for the demonstrations, Jana says she feels the media don’t show all injustices happening in her vil­lage. As soon as she hits the record button on her moth­er’s mobile phone, Jihad pans the camera while describing the atmos­phere around her. One to two min­utes later, Jana switches the camera to show her face and signs off the report with her name like a professional. “I want the world to know that we are not terrorists and to expose the army’s vio­lence against us,” she told The Arab Weekly in an inter­view at her home. Her videos, in which she talks about the plight of Palestinians as seen through a child’s eye, have gone viral on so­cial media. Her mother, Nawal Tamimi, said her daughter was traumatised af­ter a young man in the village was shot dead by the Israeli army. “He was older than her but used to al­ways be friendly and nice to her so that she became attached to him. When she saw his blood on the ground, she became frantic,” Tamimi said. Her then-6-year-old daughter approached Israeli soldiers ask­ing them, in English, why they killed her friend. “I miss him,” she shouted on a video, which is also popular on social media. Going down a long staircase to Jana’s house, it is hard not to see the tension. Used tear-gas can­isters with flowers in them hang on metal bars as a decoration re­sembling the peaceful resistance the village supports. The house’s windows are covered with wire fencing to prevent gas bombs from entering. The young girl told The Arab Weekly she used to jot down her feelings in a locked journal every night but then decided to turn to documenting her activities and emotions on video. She carried her mobile camera to Jerusalem and Ramallah talking about free­dom of prayers, arrests, suppres­sion of protests and Jewish settle­ments. Jana is often seen leading dem­onstrations. Carrying the Palestin­ian flag and chanting anti-occu­pation slogans, protesters repeat after her in Arabic and English. In her videos, she says Israeli attempts to suppress the protest will not dissuade people, but will inspire them to fight for libera­tion. “If we stop protesting, they will take the rest of the lands,” she explained. However, Jana’s mother says the girl is sometimes afraid, “I don’t push her one way or the other. She’s free to decide if she wants to participate in the protest,” Tamimi told The Arab Weekly. Getting ready for the Friday protest, Jana wrapped a black and white keffiyeh around her neck to cover her nose from a faint-causing gas as her mother asked her about her plans, “I don’t know, we’ll see,” she replied. 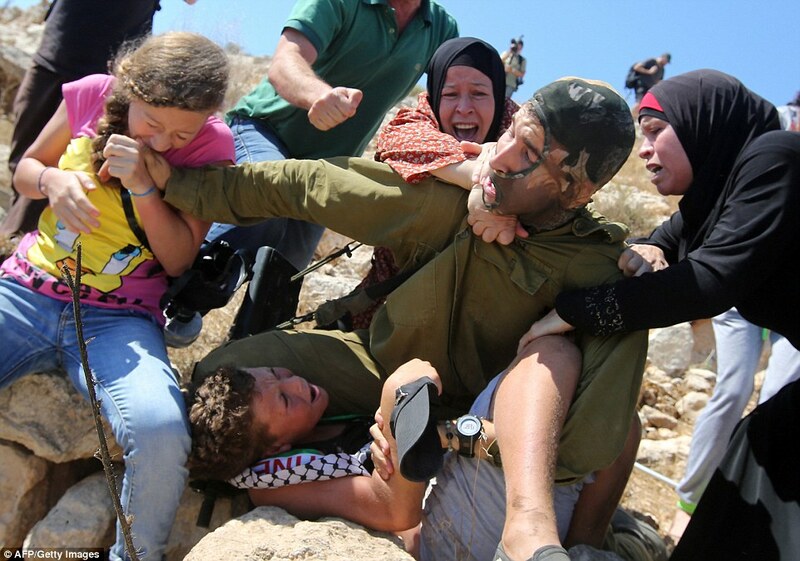 Bassem Tamimi, a leader of the popular resist­ance move­ment in Nabi Saleh and a distant relative of Jana’s, said his group was subject to criti­cism for allow­ing children to protest. He told The Arab Weekly that there is no safe place for children in the village in the first place. “A tear-gas canister broke my daughter’s arm while she was sitting at home. We care more about our children than anybody else,” he said. Instead of teaching children how to hide from their problems, he said, they should learn to con­front them. Living in a conflict zone, Pal­estinian children have been subject to detention, collective punishment and human rights or­ganisations accuse Israel of violat­ing children’s rights, particularly the right to live. Ayed Abu Eqtaish, account­ability programme director at the non-governmental organisation, Defence for Children Internation­al-Palestine (DCIP), told The Arab Weekly that 2014 was the most difficult year for Palestinian chil­dren. DCIP documented the death of 560 Palestinian children in 2014, including 547 in Gaza in the 50-day war between Israel and the mili­tant parties last June. Eqtaish ac­cused Israel of violating concepts of proportionality and distinction by targeting civilians in militant areas and locations protected under international law, such as schools, hospitals and shelters. In the West Bank, Eqtaish said 11 children were killed by Israeli army gunfire. “Investigation was not requested to be open, except for one case that was pushed by media footage and the sentence didn’t match the crime,” he added. Hundreds of Palestinian chil­dren are subject to detention and solitary confinement as well as physical and psychological vio­lence. Eqtaish said 700 children were put on trial in Israeli military courts in 2014. Back in Nabi Saleh, Jana did not march with protesters on that Fri­day and was spotted wandering in nearby fields. No report was made that day. Jana did not give any explanation why she was off. “She’s only a child,” her mother said. Rani Burnat spends every Friday afternoon engulfed in tear gas. For the past nine years, his hometown of Bil’in, a small Palestinian village in the occupied West Bank, has held weekly demonstrations against the Israeli occupation, and Burnat photographs the clashes from his battered wheelchair. Friday protests in the West Bank are hardly unique to Bil’in. The village of Nabi Saleh protests against the seizure of its only water source by an illegal Israeli settlement nearby, while people in Kufr Qaddoum protest Israel’s blockade of its main road to the nearby city of Nablus. Like Bil’in, residents of the villages of Al-Walaja and Ni’lin protest against Israel’s separation wall, which runs through their land. Media outlets don’t cover these protests, so people like Burnat have stepped in and taken on the role of citizen journalist for their communities. With no formal training, they document the struggles of their fellow villagers, filming and photographing clashes and posting what they record online. Burnat was part of the Palestinian resistance movement long before he started taking photos. On the first day of the second intifada in 2000, he was shot in the neck by an Israeli sniper while protesting the Israeli occupation on the streets of Ramallah. Burnat is now paralyzed from the chest down. He is confined to a wheelchair, has lost much of his ability to speak, and has normal motor function in only one hand. He wanted to continue participating in the resistance, but he needed to find another way to do it. When Bil’in began its Friday protests, he found it. His photography helped the village win a rare victory: After six years of demonstrating every Friday, Bil’in succeeded in changing the path of the wall, reclaiming half of the village’s land that had been taken. Protests continue in hopes of reclaiming the rest. Burnat says he’s been shot with rubber-coated bullets and tear-gas canisters more than 10 times since he was confined to his wheelchair. Because he has no feeling from the chest down, he must check his body after every protest in case he’s been shot without realizing it. According to Human Rights Watch (HRW), Palestinian journalists like Burnat are commonly targeted by soldiers, even though they often wear clothing identifying themselves as press. Bilal Tamimi, a village journalist in Nabi Saleh, has experienced this first hand. Like his fellow journalists around the occupied West Bank, he is not accredited with any media organization, which means no company advocates on his behalf when he is arrested for filming soldiers — which is actually legal under Israeli law — and he and his family are responsible for posting bail and paying any fines or hospital bills that result from his work. Tamimi says he’s been arrested four times, and has been beaten on several occasions. His family endures Israeli military raids in the middle of the night so often that his teenage children sleep with their shoes on. While Bil’in’s popular resistance got results, Tamimi’s village of Nabi Saleh has gotten attention. It’s been the focus of a New York Times Magazine story and the documentary Thank God It’s Friday, and it has hosted political figures from around the world. Many in the town credit its notoriety to Tamimi and the small team of volunteers he has gathered under the umbrella of the Tamimi Press. Tamimi Press regularly posts updates on its website and its Facebook, Twitter, and YouTube accounts. It also sends updates to local news outlets and human rights organizations. In 2011, the small village of Kufr Qaddoum, nestled between hills in the north West Bank and surrounded by illegal Israeli settlements, was cut off from the city of Nablus — and the jobs it provided to many Kufr Qaddoum residents — when the Israeli army set up a blockade on the road out of the village. Residents protested, but there was almost no media coverage. Kamaal al-Qaddoumi was one of the villagers affected, and he found himself taking on the mantle of unofficial village photographer. Like Burnat and Tamimi, Quddoumi believes his role is to show the world what’s happening in his small area of the occupied West Bank. But the men are more than just documentarians. For starters, footage village journalists shoot is frequently used in court to get Palestinian protestors released from detention after being wrongfully arrested. In addition, the presence of their cameras during clashes can often protect their fellow villagers from increased army backlash. That’s one reason why the Israeli human rights group B’tselem launched its Camera Project to provide free cameras and advice to budding citizen journalists in the Occupied Territories. Tamimi, who was one of the project’s first recipients, says the presence of cameras in Nabi Saleh makes soldiers think twice about how much force they use. 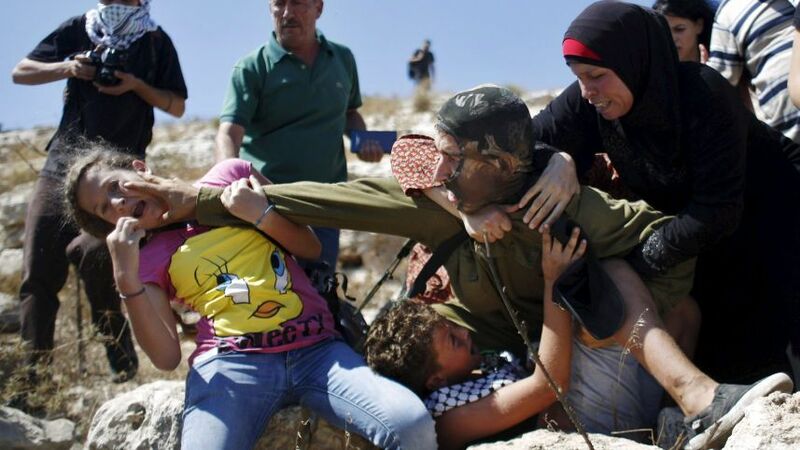 “If they know that there will not be a punishment or that no one will know about what they are doing because there are no cameras, they will be very tough with the people, and they would be much worse at demonstrations — and all the time really,” Tamimi says. While the Coalition for the Protection of Journalists tells VICE News that they consider Burnat, Tamimi, Qaddoumi and others like them journalists, all three seem torn between the identities of journalist and protestor. Tamimi proudly wears a high-visibility vest which, rather than having the word Press emblazoned on it, states: We will refuse to stay silent. On January 31 2014, the Popular Struggle Committees participants united as part of the “Melh Al-Ard” (salt of the Earth) campaign with the objective of revitalising the abandoned village of Ein Hiljeh in the Jordan Valley. The choice of the location wasn’t random; it’s strongly connected to the political requests of the action: stop the on-going effects of the Occupation’s plan and reconfirm the Palestinian sovereignty over those territories in the Jordan Valley (Area C) that Israel want to annex with the assent of the negotiations carried out by US Secretary of State John Kerry. More than 300 Palestinians from different villages of the West Bank gathered on the first day. An increased participation compared to that of 2013 in Bab Al-Shams, the Palestinian encampment erected on the outskirts of Jerusalem, where Israel wanted to build 35,000 housing units creating a corridor of settlements with the intent of fragmentising and isolating the Occupied Palestinian Territories. The transformation and appropriation of Palestinian land, implemented by Israel, doesn’t only aim to the establishment of the Zionist idea of “Greater Israel”, it also has a less visible agenda: the control of the Palestinian population and resources. The Palestinians counteract by refusing the occupant’s authority, reclaiming the Palestinian sovereignty, denouncing the occupation in all its elements and looking for new forms of nonviolent popular struggle. The aim is to create an alternative grassroots movement able to escape from corrupt government policies but with a national impact. Direct nonviolent actions as Ein Hijleh have a powerful resonance: they raise consciousness and use creative tension as a mean of bringing down an unjust system, replaced by a just and human one. To this invitation, residents of Nabi Saleh responded by leaving their village, still involved in the weekly Friday demonstrations against the Israeli Occupation Forces, to head towards Ein Hijleh. Nabi Saleh is a small village of 500 inhabitants located near Ramallah and belonging to the Tamimi family. An essential member of the Popular Struggle Committee, it’s one of the most active resistant villages in the West Bank. Positioned in area C, their struggle is against the illegal expansion of the Halamish settlement. In 2008 Ein Al-Qaws was taken over by the settlers, since then Nabi Saleh has been fighting against the Occupation system. On Friday, Nabi Saleh’s inhabitants challenged the mobile checkpoints that were blocking the main roads to Ein Hijleh. After taking a secondary road and deceiving the Israeli police, they arrived triumphantly singing their way through the palms that surround the ruins of the old Canaanite village. 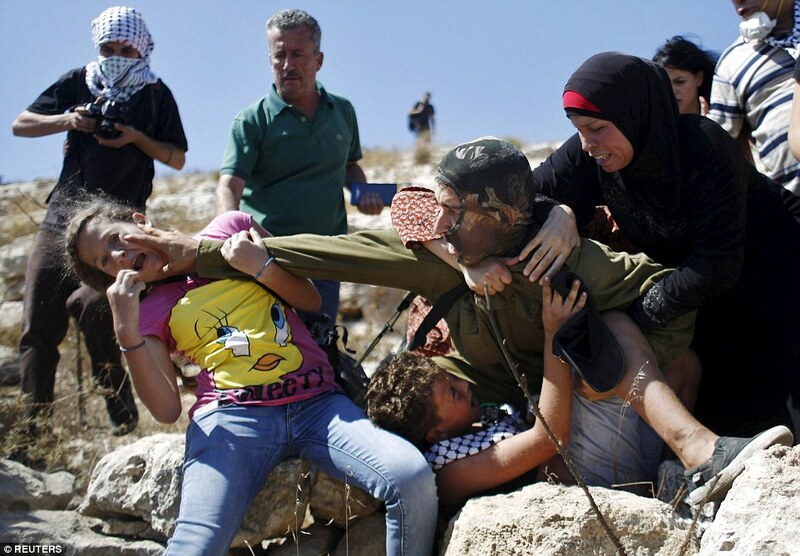 In the village of Nabi Saleh, the role of women is fundamental to the popular struggle. The commitment of women is recognised and supported because “they are the educators of the new generations. If women aren’t free nor will the new generations be”, Bassem Tamimi, recognised as Human Rights Defender by the EU, said. 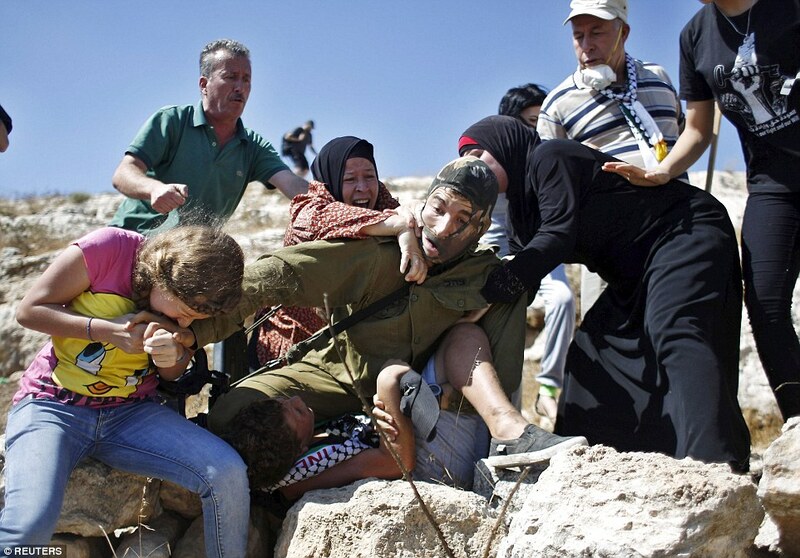 Women are the driving force of the nonviolent movement in Nabi Saleh. Every Friday, while chanting slogans and proudly holding Palestinian flags, they daringly lead the march towards the tower at the entrance of the village or towards Ein Al-Qaws. “Palestinian women are planting the seeds of resistance,” Manal Tamimi says. She explained that the women raise their children in a culture of resistance and they are teaching them not to be victims themselves but to react. 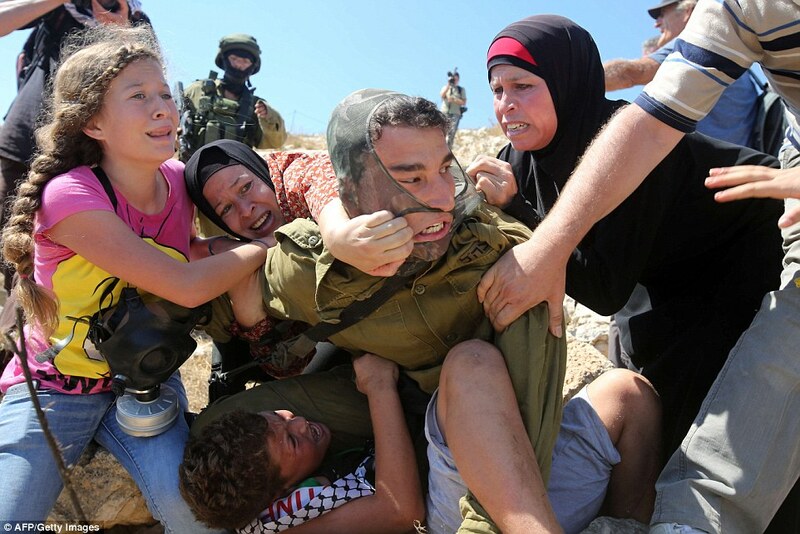 For this reason, despite the uncertainty and danger, the women of Nabi Saleh brought their children to Ein Hijleh. “We want them to learn the spirit of volunteering. It’s important for children to participate to these actions in order to grow aware of their role in the resistance,” Manal said. Women and children of Nabi Saleh are well aware of how to act in case of raids from the army, they were born and raised under occupation and they’ve had to deal with it daily. “Let them come. 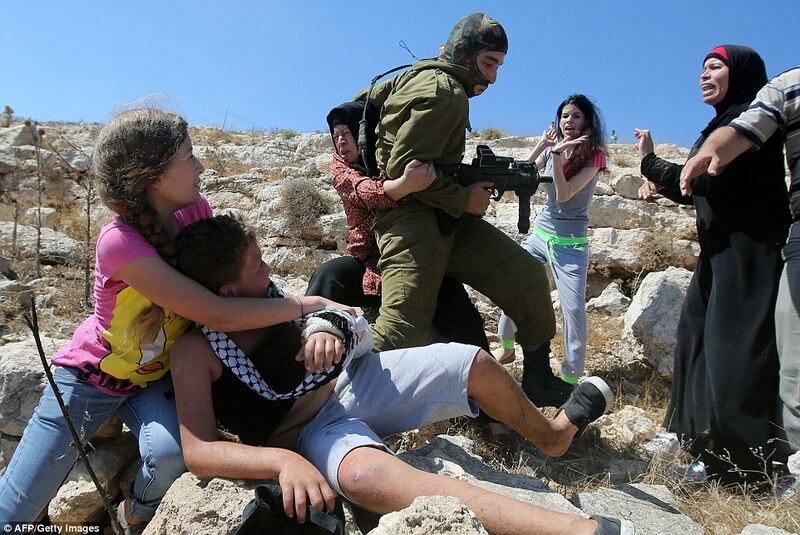 The army comes everyday to my house stepping on my land,” Rouan Tamimi said. Women also join these events to help deter the use of excessive violence towards the activists. It is pivotal to involve children and women in the construction of the foundations of society in order to assure an inclusive community. The strength of the nonviolent movement is the equality of responsibility, regardless of affiliation, gender or social class. Anyone can give their contribution to the struggle. The author is a Servizio Civile Internazionale Italia (SCI) volunteer with a Master’s degree in International Cooperation. She is currently living in Nabi Saleh and reporting about the Popular Struggle. Palestinian popular committees hold a convention in Nabi Saleh in bid to promote and unite the popular struggle against occupation and apartheid, launching a new type of weekly protest. The demonstration that followed was welcomed by soldiers with the traditional tear gas barrage. The popular committees coordinating much of the unarmed struggle against the wall and settlements in the West Bank started a new campaign on Saturday. In addition to the weekly Friday protests in Bil’in, Ni’ilin, Nabi Saleh, al-Ma’asara, Qaddum and other places, each of which focuses on local issues, activists are now planning to hold a central gathering and protest in one of the villages once a month on Saturdays. These gatherings, organized also with Israeli activists (myself included) are meant to solidify existing forces and enhance them in order to promote the culture, tradition and tools of popular resistance. The first event of this kind took place Saturday in Nabi Saleh. It was a symbolic date: 26 years since the beginning of First Intifada, which many in the movement see as a point of reference, four years since the start of demonstrations in Nabi Saleh, and two years since the killing of Mustafa Tamimi at a demonstration. Coincidentally, all in the same week, the IDF also decided to close the case against Tamimi’s killer, and supporter of the struggle Nelson Mandela passed away. Some 300 Palestinian and Israeli activists, with a few internationals as well, gathered at the village center at noon. Speeches were given in memory of the martyrs and about the lessons of the First Intifada. Speakers also linked the West Bank protests to those against the Prawer Plan and to the jailing of Druze conscientious objector Omar Sa’ad earlier in the week. The small convention was closed with a dance put on by Nabi Saleh youth, followed by a march toward the army tower at the entrance to the village. As soon as the tower was in sight, and with no provocation whatsoever, demonstrators were bombarded with tear gas canisters and scattered in an attempt to seek shelter. It took some while before the protest reorganized into two groups: one of local youth throwing stones at soldiers from an open field, the other composed of demonstrators marching toward the tower once again. 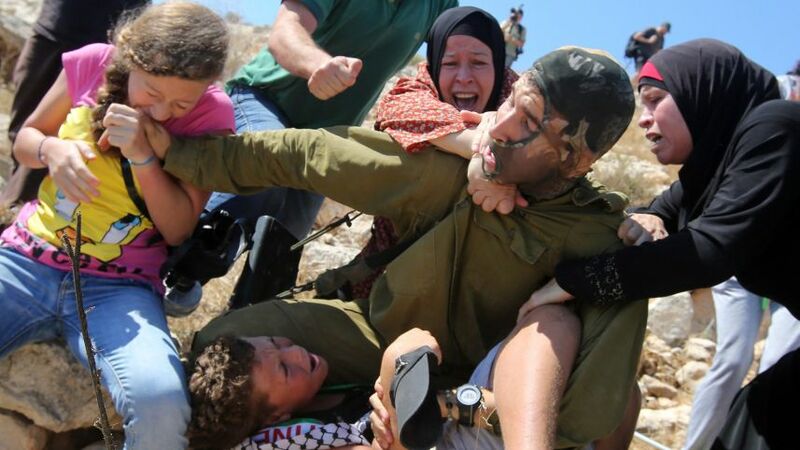 As the soldiers were preoccupied with stone throwers, shooting tear gas and rubber coated bullets at them, breaking the jaw of Mustafa Tamimi’s brother and chasing them into the village, the other group of demonstrators made it to the tower. Three were immediately detained and later released; the others were warned to leave. After a while demonstrators moved on to block the army jeeps that were now trying to exit the village after chasing stone throwers. The soldiers used force to clear the road. At the end of the protest another attempt was made to reach Nabi Saleh’s spring, which has been taken over by the nearby settlement of Halamish, and that too led to an army attack and storming on the village. The event ended after about five hours with one person hospitalized. Later, news came in that elsewhere in the West Bank soldiers killed a 15-year-old Palestinian boy by shooting him in the back.